You have to admire the person who came up with the idea of turning a device for restraining prisoners into a child’s play thing? Taking an item like a heavy ball and chain and converting it into a keep fit toy was a stroke of genius! 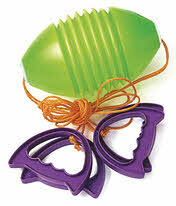 I’m talking about the Skip-It, which basically consisted of a rotating plastic ball on a length of flexible plastic that was attached at the other end to a plastic ring. You placed one foot into the ring, then by skipping up and down you could get the ball rotating around your leg. 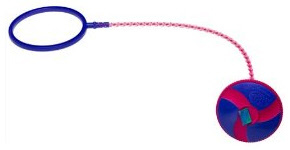 You then had to skip over the long chain-like part of the toy whenever it came round by your other foot. Whilst I can’t prove that the ball and chain was the inspiration behind this toy, it seems pretty likely given that it looks exactly like one and was worn in the same way! The Skip-It first appeared in the Eighties and became one of those instant fad toys that everyone wanted to have, and before long there were many badly constructed but cheaper copies of it in the shops, and children up and down the country were tripping over themselves trying to master the action required to keep the ball in motion. In the early Nineties the popularity of the Skip-It was on the wane, but the makers then had to great idea of adding a counter to the ball which kept track of how many times it had been swirled round your ankle. 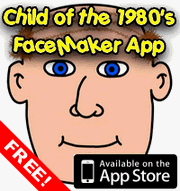 A great idea, assuming it was accurate of course, as it then meant you had the aim of trying to beat your highest score, and you could compete with your friends to be the playground Skip-It champion too! One toy that I’m sure most people must have had as a child is the good old fashioned water pistol. Those little hollow plastic guns that you fill with water to soak your mates have been around seemingly forever. There’s something completely irresistible about these toys. Put them in the hands of even the biggest pacifist and the urge to pull the trigger whilst aiming it at somebody to give them a little squirting becomes near impossible to stop. The fact that the average water pistol was made out of transparent plastic is also a master stroke, as it means a quick glance is all that is needed to see whether you should be planning a quick retreat to the nearest tap for a reload any time soon. In my day you couldn’t get much more than a simple pocket money water pistol like the one that illustrates this post, but these days water pistol design has really gone to town with things like the Super Soaker range. The first pair of roller skates I ever had a go on were a pair that were given to me, if I remember correctly, by my cousin. These were a pair like the small inset pair in the image accompanying this post, consisting of a couple of metal rails with wheels on that could be adjusted for size, and piece of leather to stick your toes in and a strap to tie up around the ankle end of your foot. Forgive me, but they were rubbish. The wheels didn’t really run very smoothly so you didn’t so much skate as just push your feet forward and slide along a bit. This would have been the late Seventies, so forward time a little bit and suddenly there is a craze for a new style of roller skate. 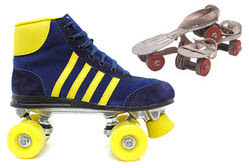 These consisted of a pair of proper boots that looked like trainers that went above your ankles, which were attached to a plate with four smoothly rotating ball bearing mounted wheels (they looked very similar to the sort of wheels on a skateboard) and a big rubber stop under the toes which could be used to come to a halt. What was the best selling car in America in 2008? A Ford perhaps? Maybe a Chevrolet. 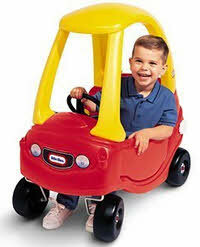 Nope, it was actually the Little Tikes Cozy Coupe, which shifted nearly half a million in the US alone! OK, trick question, but I thought it was an interesting little nugget of information! I certainly remember these from my childhood, although I never had one (instead I had a cool police pedal car instead). I did however recently get one for my daughter for her birthday, and she absolutely loves it. The Cozy Coupe celebrated it’s 30th anniversary last year (it actually first went on sale in 1979) and to celebrate it has been given a little remodel and now boasts a large pair of comic eyes on the front, a licence plate (OK, a sticker) on the back, an ignition key, and, get this, a drinks holder! Despite these new additions though it basically still looks exactly the same as it always has, and the picture above is from before the restyle. This classic design comprises a red plastic body, complete with a single opening door and petrol filler cap, and a yellow curved roof on yellow supports plonked on top. Here’s a rather more obscure toy that you might have had for playing in the garden. It was called the Swoosh Ball although I’m sure it had other names too. I have a vague memory of something called a Ripperoo, which may well have been this particular toy. The Swoosh Ball looks a bit like a plastic rugby ball. It is threaded on to a couple of lengths of cord which have grip handles on each end. Two people each take hold of two of the grips, and the Swoosh Ball is positioned at one end of the strings. I guess the idea was to play a tennis like game, sliding the ball back and forth until one player failed to return it, although apart from getting tired arms I don’t think it would have been that hard to miss sending the ball back, as there wasn’t an awful lot of skill involved it would seem. When these came out in the late 1980’s I really wanted a set, but there were two drawbacks. First they cost a fair whack, and secondly you really needed a group of friends with them to make it worthwhile. Suffice to say I never got a Laser Tag set, but that was OK, as since then I’ve had the chance to play the game in places such as Laser Quest and Quasar, and I’m pretty rubbish at it. The packaging and advertising for Laser Tag was, as you might suspect, a very futuristic affair with people shown running around in a variety of Bladerunneresque costumes consisting of lots of lycra and body armour, shooting each other in some science fiction themed warehouse setting. Contrast that to Peter and Billy running up and down the street with only lamp posts for cover and wearing the sensor over their school uniform. Not quite the same, but then that’s why we’re given imaginations, isn’t it? I have fond memories of bouncing around the back garden on my Space Hopper as a kid (one of the reasons why I chose it as the icon for my garden toys posts), and whilst it might not have been the most practical or energy efficient form of transport it was a lot of fun. 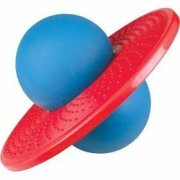 Â I especially loved the sound it made when bouncing on a hard surface such as concrete. Â It had an almost metallic ring to it, as the air reverberated around inside the rubber of the Space Hopper itself. Nowadays I’m probably a bit too big to hop around the back garden like mad on a piece of inflated orange rubber, but I can take the fun inside with these rather nifty little Clockwork Space Hoppers, available from Stocking Fillers. 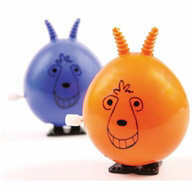 Â These little guys hop around frantically for ages once you’ve wound them up, and better still they come in backs of two (one in the classic orange colour, the other a dark blue) so you can even have indoor Space Hopper races!